After Franklin D. Roosevelt managed to win four consecutive terms for the presidency, many people believed he could have kept going for even longer. However, Roosevelt died during his last term and Harry S. Truman became president in his stead. Truman’s presidency was marked by two important historical occurrences: the end of World War II and the start of the cold war. Growing up, Truman was very close to his mother and was largely interested in music and history. Because his father’s friends were deeply involved in the Democratic Party, Truman became an active Democrat at a young age, earning political positions with the help of his father’s connections for most of his career. Truman’s first job was as a timekeeper for the Santa Fe Railroad right after finishing high school. Truman did not earn a college degree, although he did enroll in college for a semester and later took a few courses at law school. Instead, he joined the Army in 1917. At the start of WWI, Truman joined the National Guard. He quickly moved up the ranks and became a leader. By the end of the war, he had been made captain. Once the war ended, Truman returned to his home and married Bess Wallace, the woman who had turned down his first proposal in 1911. They married in 1919 and had a daughter in 1924. It was during this time that Truman, with several failed business behind him, ran for local office. He was elected as a judge to the Jackson County court, which was actually an administrative position, notwithstanding the name. Although he lost the re-election, Truman was later elected as presiding judge for the county court, and in 1934 he was elected to the U.S. Senate for Missouri. 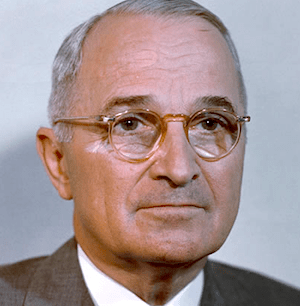 By 1944, Truman had been elected to the vice presidency. When Roosevelt died, Truman took over the White House, even though as vice president he had rarely been involved in any of Roosevelt’s decisions. When Truman assumed the presidency, he decided early on to use atomic weapons against Japan. This ended the war but was also one of his most controversial decisions. Truman’s administration became even more involved in foreign policies, including helping to found the United Nations, passing the Marshall Plan with $13 billion in funds going to help rebuild Europe, and taking control of the ability to stop communism from spreading. It was also during Truman’s term that the cold war with the Soviet Union began, as well as the Korean War. As a young boy, Truman had wished to attend the U.S. Military Academy at West Point. However, he was unable to pass the eye exam and was disqualified as a result. During his vice presidency under Roosevelt, Truman and the president met in private only twice. In fact, the president rarely bothered to involve Truman with his decisions. Though Truman tried several times to build a successful private-sector business, each of his businesses ultimately failed.